EES Consulting is a small registered professional engineering corporation that offers strong electrical and civil engineering experience and expertise in hydroelectric project engineering: reconnaissance and feasibility, final design, construction management, design of dams and intake structures, pipeline and penstock design, and FERC Part12D Safety Inspection Reports. Since 2002, EES Consulting has designed seven hydroelectric projects: Youngs Creek (7.5 MW), Choloma (9.5 MW), El Dorado (1.1 MW), Anyox (30 MW), Kitsault (7 MW), Homestake (10 MW), and Candelaria (4.5 MW). Four were constructed and two won engineering awards. Construction of Anyox, Kitsault and Homestake is pending negotiations with B.C. Hydro. EES Consulting’s services for all these projects were civil, mechanical, and electrical engineering, drawings and specifications, calculations, construction management and commissioning. We have projects in Washington, Oregon, California, Nevada, Alaska, Hawaii, British Columbia and Guatemala. Our typical services provide project management, final construction drawings and specifications, contract and bid documents, water to wire equipment supply and commissioning support. We enjoy long term relationships with our clients and because of our size we respond quickly to our client’s needs. 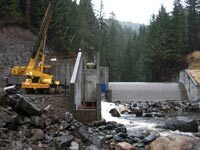 Commissioned in 2011, Youngs Creek is a low impact, high head project and is the first hydro project built in Washington in nearly 20 years. 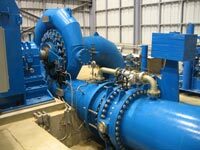 The project won Hydro Project of the Year Award in the 2012 Excellence in Renewable Energy Awards Program, and American Society of Civil Engineers 2011 Honor Award for Local Civil Engineering Achievement. The project is located in the Santa Cruz Mountains in Guatemala. This unique project features six intakes, 7,000 meters of low pressure HDPE pipe, a steel tank forebay (61 meters diameter by 10.6 meters tall), 3,000 meters of high pressure steel penstock, 460 meters of head and a powerhouse containing a two-jet horizontal Pelton turbine and generator. 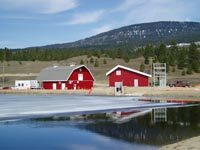 Located in British Columbia, this project replaces the pressure reducing valves used at the drinking water supply reservoir to produce power. EES Consulting was retained to develop plans and specifications to support a turbine and generator supply contract, a contract for purchase of all electrical and controls equipment, and the construction contract to build the powerhouse and tailrace. EES designed the new powerhouse to match the existing valve house. 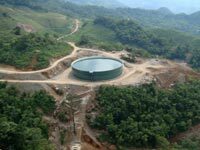 EES Consulting’s scope of work included project management, final design, drawings and specifications, services during construction and commissioning of this project located in Guatemala. The project diverts water through a tunnel after it has passed through an existing powerhouse. An intake located at the end of the tunnel transitions the water into a penstock where it flows under pressure to the powerhouse.